This grand seafront building was once home to Colet House School. This was a private prep school, preparing boys aged up to 13 for life and study in public (fee) schools. 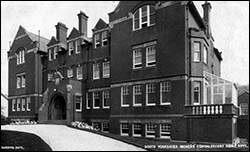 In 1930 the building became a convalescent home (as pictured right) owned by the South Yorkshire Miners’ Welfare Organisation. 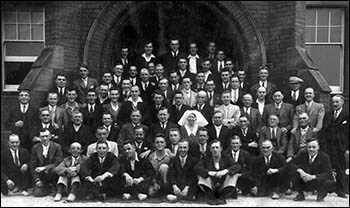 The photo below left shows some of the miners and staff, including at least one amputee. St David’s Residential Home opened here in 1985. In the 1890s RM Hugh Jones was headmaster at Colet House. He was part of the Colet House football team, which played against masters from other schools in the area. He remained the headmast er during the First World War, in which a former teacher and several old boys were killed. Among them was Captain Kenneth Herbert Hugh-Jones, who left the school c.1910 and later gained a scholarship at Guy’s Hospital, London. He enlisted in the Artists’ Rifle Corps and was killed in France on 20 September 1917. Wilfred David Powell Jones was a master at Colet House before enlisting in 1915 with the Royal Fusiliers. He was born in Llandeilo, Carmarthenshire, and killed in France, aged 31, on 18 November 1916. 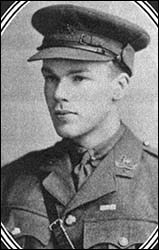 Second Lieutenant Gilbert Lloyd Vawdrey, whose parents lived in Cheshire, attended Colet House and trained as an army officers at Sandhurst. He joined the Welsh Regiment and was killed, aged 20, on 10 November 1917 while “carrying an important message” to headquarters near the front in Belgium. Second Lieut John Wathen Eyton Lloyd, another past pupil, worked at the Shotton Engineering Company before the war. He joined the army and later transferred to the Royal Flying Corps (the RAF’s predecessor). He was killed on 24 June 1917, aged 22. Capt Richard Conway Lowe (pictured right) was educated at Colet House and Oxford University. He received the Military Cross in 1915 for “conspicuous gallantry in France” with the Warwickshire Regiment. He was Mentioned in Despatches in 1916 and killed in the Battle of the Somme on 18 August 1916. John Gurth Morgan-Owen was born at Bronwylfa, Rhyl, and educated at Colet House and Oxford University. He excelled at football, cricket and hockey. He was a schoolmaster in Argentina when war broke out. He travelled home to enlist but needed the help of a doctor friend to do this, because a shoulder ailment initially prevented him from joining the army. He joined the South Wales Borderers and was killed on 9 April 1916.